Is the Battle of San Jacinto relevant today? Painting of the Battle of San Jacinto by Henry Arthur McArdle, 1895. On April 21, 2019, Texans will commemorate the 183rd anniversary of the Battle of San Jacinto. Non-students of history may be tempted to ask if a battle that occurred nearly two hundred years ago is still relevant in the world in which we live. Students of history, however, realize that Houston’s victory over Santa Anna mattered then and still matters today. As a historian, I tend to view past events as links in a chain rather than unrelated, isolated, random occurrences. The significance of something like the Battle of San Jacinto becomes more clear when placed in a larger context. The discovery of North America initiated a race between European nations to claim and occupy large regions of land on which to establish colonies. Although several minor countries participated early on, the three major contenders in this contest for empire were France, Spain, and England. Entering North America from their strong hold in Mexico, the Spanish established outposts which stretched from Florida all the way to California. France, after a failed bid to settle the Carolinas and Florida, established control of the St. Lawrence River in Canada. Using the Great Lakes as a gateway to the interior, their explorers ventured down the Mississippi River to the Gulf of Mexico, claiming the central part of the continent for their King. Arriving late, the English laid claim to the Atlantic coast, the site of its thirteen colonies that would rebel in the future. The international competition to control North American guaranteed there would be conflict between France, Spain, England and their Native American allies. Three battles — Quebec, New Orleans, and San Jacinto — decided who would control North America. In the early 1700s, the French fanned out from their strongholds along the St. Lawrence River, taking advantage of the numerous waterways that led to the interior of the continent. They planned on making the entire Mississippi River valley a part of their North American empire. French trading activity even extended as far as Texas, causing concern for Spanish officials. It was the English, however, who stood in France’s way of gaining control of the Ohio River valley and its tributaries. In 1754, England, now part of Great Britain, attempted to oust the French from the confluence of the Allegheny and Monongahela where they join to form the Ohio. (This is the site of Pittsburgh, Pennsylvania.) This clash sparked the French and Indian War which lasted from 1754 until 1763, a conflict that changed the political face of North America. Gaining control of the St. Lawrence River became a major objective for the British in the war. By 1758, the English occupied the French province of Nova Scotia. They even captured Fort Louisbourg, which guarded the entrance to the Gulf of St. Lawrence. In 1759, a combined British sea and land force advanced on the city of Quebec, the capital of French Canada since 1608, besieging the walled city. Early on the morning of September 13, 1759, Major General James Wolfe successfully positioned 4,500 British troops just to the west of Quebec on a field called the Plains of Abraham. The French commander, the Marquis de Montcalm, responded to the threat by sending 5,000 French troops out to meet Wolf. In the battle that followed, the British defeated the French and captured Quebec. This victory led to the French giving up Canada and the Ohio River valley to Great Britain in the Treaty of Paris (1763). This is important because it removed France from the contest for North America. In 1775, British colonies living in North America rebelled against their King and initiated a war for independence that ended in the creation of the United States. One of the colonists’ complaints had been that the British government had denied them permission to settle in the former French regions of Canada and the Ohio River valley. At the end of the war in 1783, a second Treaty of Paris confirmed Great Britain’s right to Canada but awarded the land situated between the Appalachian Mountains and the Mississippi River to the United States. Great Britain, however, refused to evacuate its outposts and even encouraged its Indian allies to attack Americans moving west. The United States cited this activity as one of the causes of a second conflict with Great Britain called the War of 1812. The major theaters of the war in North America were Canada and the coastal regions of the Atlantic Coast. The US fared poorly in its campaign to seize Canada, and even failed to prevent the British from burning its national capital, Washington, D.C. Nevertheless, one battle on the banks of the Mississippi River ended Great Britain’s dream of once more controlling North America. In December 1814, British forces landed on the Gulf Coast near the mouth of the Mississippi. They planned to capture of the city of New Orleans, an act which would give them control of the Mississippi and all the land it watered, thereby keeping the United States penned along the east side of the Appalachian Mountains. On the morning of January 8, 1815, Major General Pakenham led an army of 8,000 men against a smaller U.S. force commanded by General Andrew Jackson. Entrenched behind a wall of cotton bales in a swamp next to the river, the Americans made short work of some of Britain’s finest soldiers. Jackson’s victory over the British ensured that the United States would control both the Mississippi River valley, as well as the recently acquired Louisiana Purchase (1803). Great Britain, while still having a presence on the North American continent, was left with only Canada. The Louisiana Purchase put the United States and Spain on a collision course. Based on former French claims, many American believed that Texas had been part of Louisiana and were eager to claim the region. The wars for Mexican independence (1810–1821) provided opportunities for American filibusterers to support republican forces fighting in Texas against Spanish Royalists. In 1821, Mexico declared its independence and inherited all the land that had previously comprised New Spain. This included Texas, New Mexico, Arizona, Nevada, Utah, and California. Needing to populate Texas, Mexico allowed Americans into Texas as colonists. Infighting between political factions inside Mexico led to American colonists demanding separate statehood, a move that opened the door to Texas independence. Although the Battle of the Alamo gained the most attention in the ensuing Texas Revolution, it was the action on the banks of the San Jacinto that decided the destiny of North America. 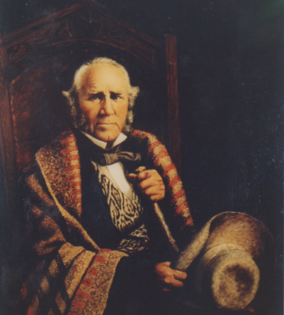 Painting of Sam Houston by William Henry Huddle, 1886. The revolution started off in favor of the rebels before turning against them. By the end of December 1835, the colonists and volunteers from the United States had captured both Goliad and San Antonio de Béxar. This resulted in the withdrawal of all Mexican troops from Texas. However, a two-pronged advance into Texas by the Mexican Army recaptured both locations, and pushed the Texans eastward toward Louisiana. On the afternoon of April 21, 1836, roughly 1,000 men under General Sam Houston attacked General Antonio López de Santa Anna’s camp along the banks of the San Jacinto River — trapping and defeating the larger Mexican force — ending Mexico’s attempt to crush the rebellion. The inability of Mexico to resume its campaign against its rebellious department granted life to the Republic of Texas. Let’s review the idea of historical events as links in a chain. The Battle of Quebec removed the French from active participation in the settlement of North America. Friction between the British Parliament and American colonists over the future of Canada and the Ohio River Valley was one of the causes of the American Revolution. Following its defeat in 1783, Great Britain was reluctant to give up its claim to the trans-Appalachian region, a factor resulting in the War of 1812. Jackson’s victory over the British at New Orleans freed Americans to push westward into Texas. The Texan victory at San Jacinto severed Texas from Mexico. The annexation of Texas (1845) and the subsequent War with Mexico (1846–1846) ended with the United States’ acquisition of the northern tier of what had been New Spain. 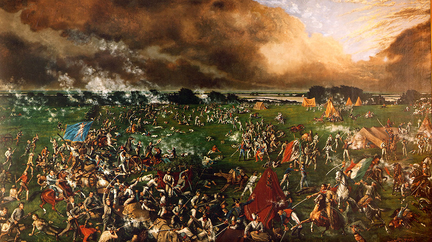 When viewed in this context, the Battle of San Jacinto becomes an important link in this historical chain which enabled the United States to become both a continental and world power. So, yes, the Battle of San Jacinto and its ramifications are still relevant today. DeVoto, Bernard. The Course of Empire. Parkman, Francis. Montcalm and Wolfe: The Riveting Story of the Heroes of the French & Indian War. Owsley, Jr., Frank L. The Struggle for the Gulf Borderlands: The Creek War and the Battle of New Orleans, 1812–1815. Moore, Stephen L. Eighteen Minutes: The Battle of San Jacinto and the Texas Independence Campaign.